This article walks you through the steps to upgrade your version of Insightd on Windows Servers. 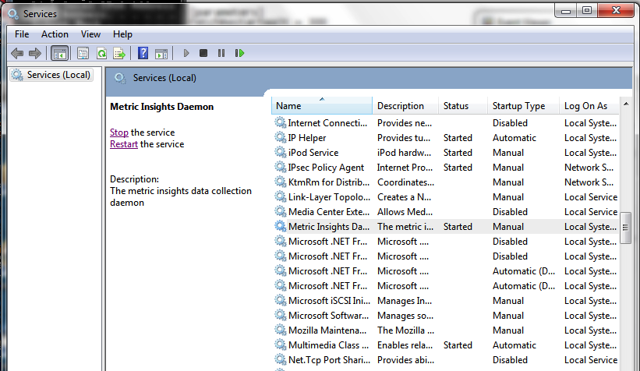 Insightd is the Windows service that runs the Remote Data Collector for your Metrics Insights application. You can review more about what this is in the Overview of Remote Data Collection. To get a new version, follow the steps on how to download the new version in the article for Installing Insightd on Windows Servers. Start with Step 1 and continue to Step 3, the steps that explain how to download the Insightd installer. After getting the new version of the Remote Data Collector in the previous step, the next steps are to uninstall the old version and then to install the new version. The next several steps walk you through how to uninstall the old version of the Remote Data Collector. Before uninstalling the old version of the Remote Data Collector, make a backup copy of your config.ini file (located at "Metric Insights\Insightd\config\config.ini") and save it somewhere such as your home directory. Now stop the Remote Data Collector if it is running. 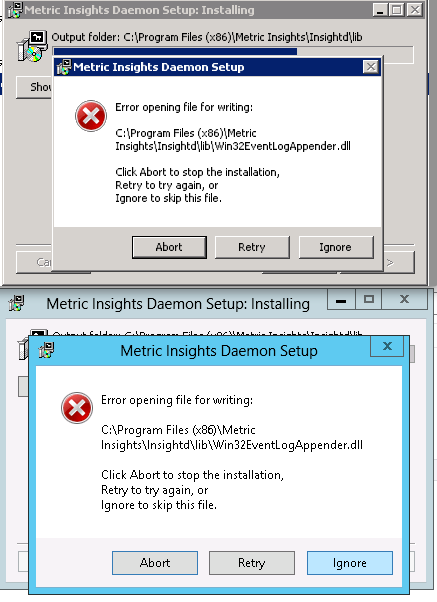 Find the Metric Insights Daemon in the Windows Services control panel. If it is running then the panel will show you an option to Stop the service and to Restart the service. If the service is not running, then it will only show you an option to Start the service. If the service is running, then Stop the windows Insightd service. Once the Insightd Windows Service is stopped, then it is safe to uninstall the service. Run the uninstall-insightd.exe file located at "Metric Insights\Insightd\bin\uninstall-insightd.exe". You can double click on it to run it. Finally, after completing the above steps of getting the new version of the Remote Data Collector, and then uninstalling the old version, the next step is to install the new version. The next several steps walk you through how to install the new version of the Remote Data Collector. To install the Insightd Windows Service, follow the steps in the article Installing Insightd on Windows Servers that explains how to extract the installer from the downloaded file and then how to install the service. Only go as far as running the installer. Do not start the Insightd Windows Service yet. Follow Step 4 through Step 5 in the article Installing Insightd on Windows Servers. If you get "Error opening file for writing: ...Win32EventLogAppender.dll" just click Ignore and continue. Copy the config.ini file you saved in a prior step to the "Metric Insights\Insightd\conf\" directory. Finally, start the Insightd Windows Service. Continue at Step 6 in the article for Installing Insightd on Windows Servers.